Over these three days, students worked in pairs to analyze their performance AP Physics 2 practice exam. On the first day, students worked with a partner to review the multiple choice questions that they missed and read through the annotated solutions for the practice exam. I captured any question that a pair had to discuss with the entire class later. On the second day, students continued to review their performance on the multiple choice portion of the exam. We also discussed the most frequently missed multiple choice questions as a class. On the third day, we shifted to the free response portion of the exam. I scored it very strictly, and scores were lower than I expected. We’ll see how the practice exam compares to the actual AP Physics 2 exam in a few days. We focused primarily on the first two free response questions, and specifically on how the short answer and paragraph-length responses need to written carefully to ensure that the question asked is being answered. Today was not a normal day of school as there was PARCC testing for freshmen. AP students were strongly encouraged to attend a practice exam or review session in the morning and another in the afternoon. It wasn’t a perfect system since many students have more than two AP courses and had to choose. 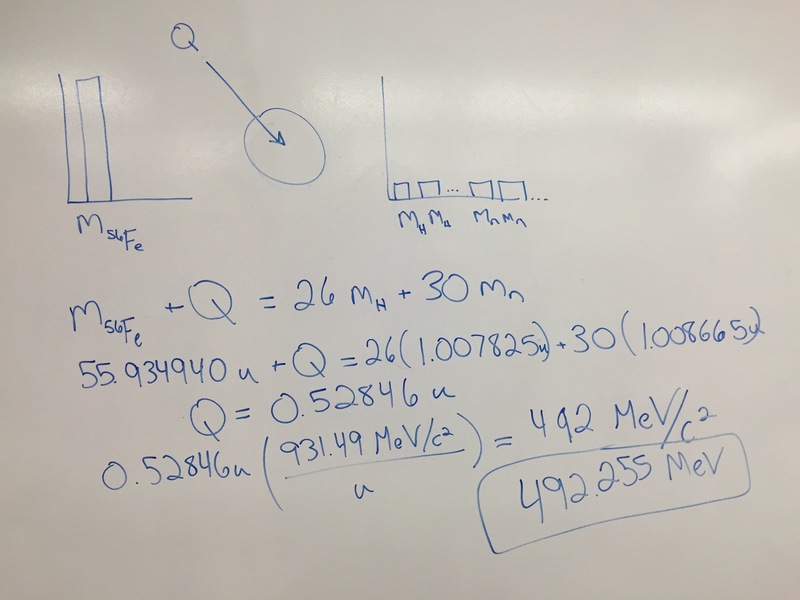 However, it was great to have a vast majority of my students for a three-hour block of time in which to administer the AP Physics 2 practice exam, which also counts as their final exam. It will be a very busy couple of days to score all of the exams, especially since I do the same thing in AP Computer Science. However, students in previous years have shared how useful it was to take a full-length exam, have it scored, and use it to direct their review efforts over the next week. Today, I shared with the AP Physics 2 students the structure of the AP Physics 2 exam and the practice exam that they will take on Monday. This practice exam counts as their final exam for the course. This provides sufficient motivation for students to take it seriously and, therefore, it serves as a great indication of where they should focus their efforts for the next week and a half to prepare for the actual AP Physics 2 exam. It was harder than usual to set expectations for the exam since I’m not sure exactly what to expect with the new course. Regardless, I feel that the adjustments that I made this year to better align with the focus of the new course have worked well, and I expect students will be well prepared. I am anxious to see how they do on the practice exam on Monday! Today, AP Physics 2 students completed their last unit exam of the year! Time to start reviewing for the AP exam…. 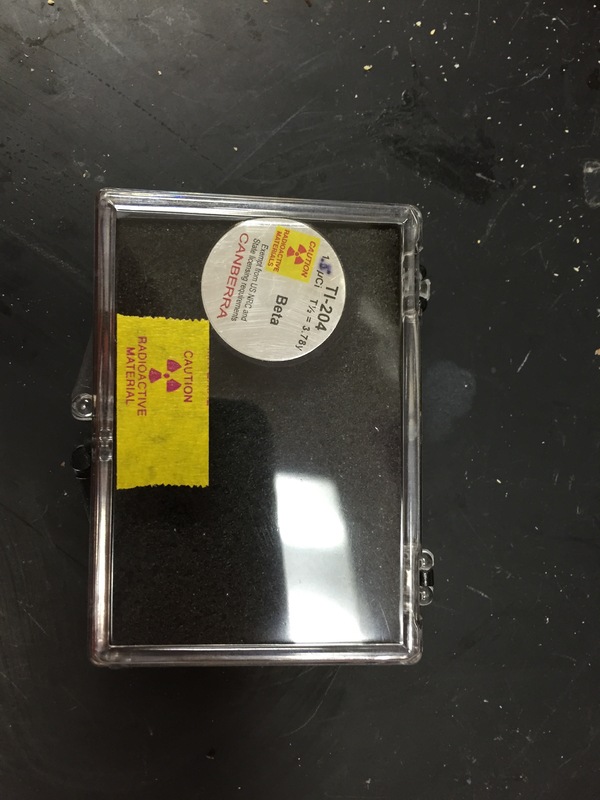 Today, students explored the stochastic nature of radiation my measuring the beta decay from samples of Tl-204. The lab doesn’t require a great deal of interaction; so, we discussed other topics while gathering data. I like to share the story of the assassination of former KGB agent Alexander Litvinenko with polonium-210. This gives us the opportunity to compare and contrast beta decay and alpha decay. The original version of the lab came from a colleague at our sister high school. The analysis and discussion questions have students calculate the full-width at half-max for the histogram. Is this a common statistical measure for this type of data? I’m not familiar with it in this context and not sure why calculating the standard deviation wouldn’t suffice. Any ideas? Today, we I introduced nuclear decay, fission, and fusion. I always feel bad that nuclear physics is such a rich topic and we rush through it at the end of the semester. We did answer a very important question today which is why do elements such as Radon exist if they have such short half lives? I’m not sure where I found this chart, but it clearly answers this question. I also shared the story of SCRAM “safety control rod axe man” and the role of that person during the development of the nuclear reaction at the University of Chicago. Potentially apocryphal, but a great piece of local history! One group realized that the area under the plot of number of “nuclei” decayed in a given roll vs. time was the total number of nuclei decayed. They integrated the function that fit the graph to find the half life. 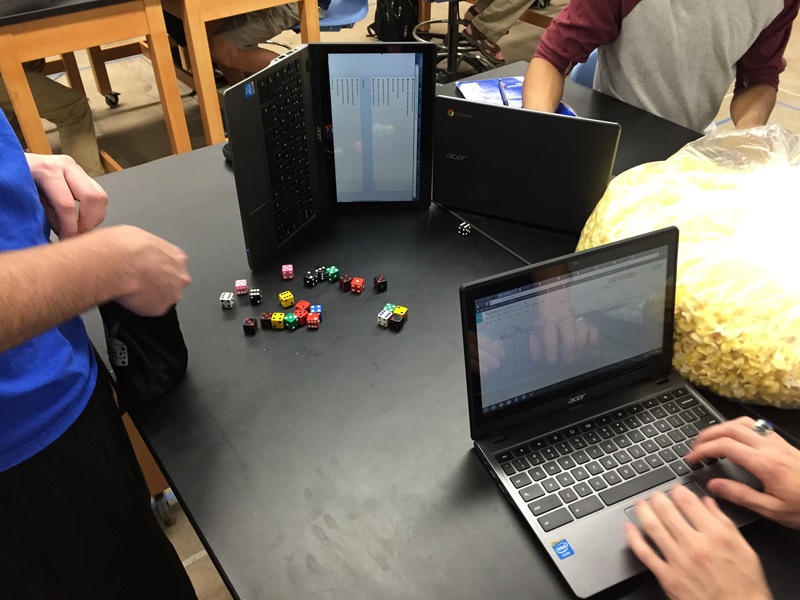 This year, we used our new collection of dice to perform the half life lab instead of M&Ms. Over the two classes, we aggregated over 1100 rolls. For homework, students will plot the aggregated data in three ways: number of “nuclei” remaining vs. time, number of “nuclei” decayed in a given roll vs. time, and ln(number of “nuclei” remaining vs. time). 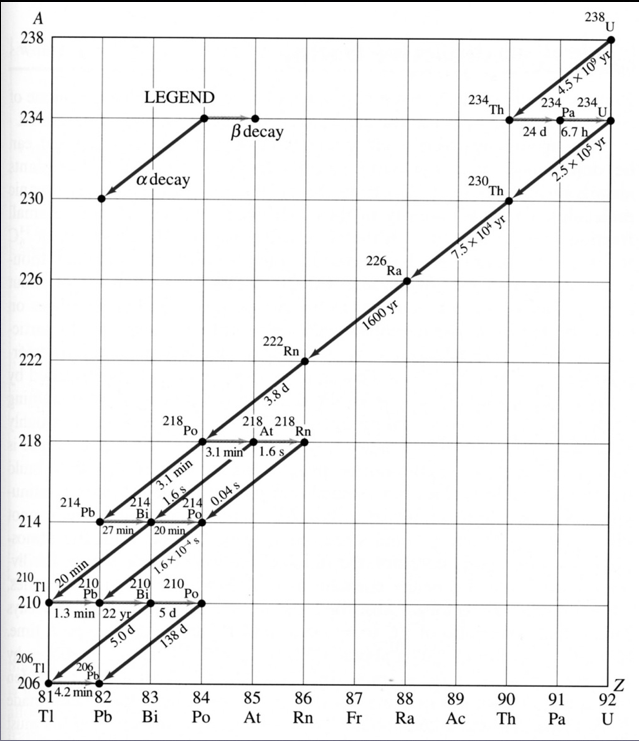 They then will use each graph in some manner to determine the half-life of the sample. Today, we started our final chapter of the year. I absolutely love how binding energy problems are easily solved and presented using energy LOL diagrams where mass is simply another energy storage mode.